Wings Unlimited, the next generation in sprint car wing manufacturing, is leading the way to future technology in sprint car racing. Check out the Recently Listed Wing and Spoilers and Components. Wings Unlimited Wicker Bill Nose Wing - 1". Wings Unlimited Wicker Bill Nose Wing - 1/2". Pit Stop USA is The Online Motorsports Superstore! Wings Unlimited, the next generation in sprint car wing manufacturing, is leading the way to future technology in sprint car racing. Since the start in 2000, Wings Unlimiited has risen to the task of proving that we have the best product available. Over the years, we have not only proven ourselves locally, but also on a national level. With the future fast approaching and new technology growing, Wings Unlimited is searching for a more aerodynamically inclined wing on a daily basis. 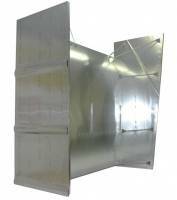 We feature Wings Unlimited Sprint Car Wings at low everyday prices.